Oh, I hate writing those words. I hate it so much, but alas here are facing the fact that sometime in the near future we will wake up and notice the leaves changing color, the days becoming cooler, we are reaching for sweaters, and the days get a little rainier. It is inevitable no matter the amount of avoiding we do. 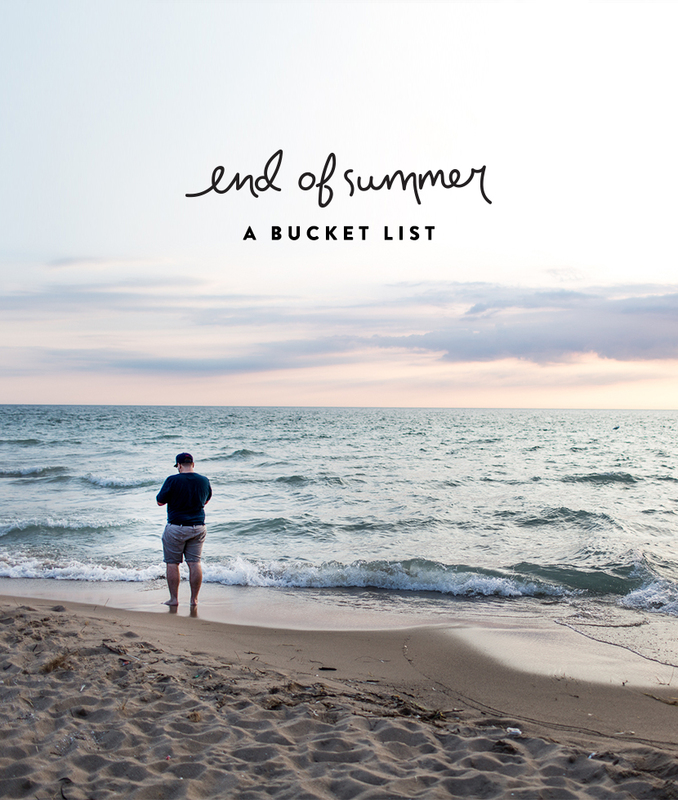 Summer is truly ending quicker than we care to recognize, but BUT I got an idea of how we can make sure we FULLY enjoyed this season: A Bucket List. I am a big believer in find ways to fully enjoy moments. I remember having the most depressing thought one time driving along the M-22 on the coast of the lake. I was so enamored with the color of the water and the sun perfectly hitting it so you could see the sand bars in their perfect turquoise color. I realized how fleeting that moment was and then had major scaries when I realized that we are only given so many summers. Maybe we will have 80-90 of them in our life. Some will have more and some will have less. It is a sad reality, but all the more reason to recognize the importance of enjoying the life we are given as fully as we can. Just in case you had a wild summer and you feel like it completely slipped through your hands you feel like there is no way you will have actually enjoyed this season, guess what?! Take this list with you for the next few weeks and cross these things off and I promise you won’t feel too much like summer just visited without you noticing. Some of these are big and some are small. Go at it as you, please. What are some things still on your bucket list to make you feel like summer really was enjoyed this year? Summer went by so quickly this year! I hate to think that it is coming to an end soon. This is a great bucket list. I have yet to swatch a summer sunset, which is something i normally do every year. I’m adding it to my list now! I have stage 4 breast cancer and not one single day do i take for granted, not one single sunset do i dismiss, cheers to and endless summer-giving way yo a cozy fall. Sandra thanks so much for your comment. I am so glad you are finding ways to enjoy every day. It is so so so important no matter what, because life goes far too quickly. Enjoy the transition from summer to fall. What a fun and beautiful list to cross off things to do while summer is almost gone. I also hate to think summer is nearly ending, but I like to think that every season has its charm. Although summer’s my favourite season. I already did quite a few things on your list, although I never thought of snapping a picture of the wilderness while driving with the windows down. 🙂 Must try that one!